A pair of memorably beguiling, well-matched performances turn what could have been a cloying children's movie into a bittersweet heart-warmer in The Butterfly, a French confection that eschew cuteness for character. Michel Serrault (La Cage aux Folles) stars as a kindly old grump of an amateur entomologist, and button-eyed, be-freckled, 8-year-old Claire Bouanich matches wits with him as a lonesome latchkey-kid neighbor who stows away in his car as he departs for a long hike in the remote Alps on an obsessive hunt for an elusive butterfly. Unwilling to cut his trip short and (for reasons just on the passable side of forgivably contrived) unable to phone the girl's neglectful young mother, the old coot reluctantly lets her tag along -- and while the bond that soon forms between them is inevitable, it's so unaffected and peppered with little surprises that the film casts a melodious spell nonetheless. Serrault strikes a perfect balance of acerbic edge, surly sense of humor and emerging affection as his commune with nature is both spoiled and enhanced by sharing it with his naturally inquisitive tag-along. But it's Bouanich who makes the picture captivating. Quiet yet wonderfully curious, bold but not bratty, this moon-faced little girl captures the subconsciously tarnished innocence of a child who is accustomed to having the blues. She's a girl wearily on the verge of realizing she hasn't anyone to count on but herself -- and yet instinctively casting about for a grown-up she can rely upon for the kind of nurturing fondness her ingenuous heart still expects. 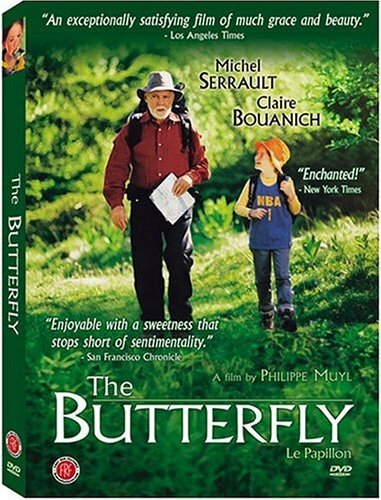 While The Butterfly sometimes seems a tad too expedient in its plotting and in the proximity of convenient Life Lessons ("You know Elsa, death is a part of life..."), it's earnest and artless in a way Hollywood movies prominently featuring precious children have never been. And it's more realistic: When Muyl cuts away from this slowly warming friendship, it's to show a manhunt underway for the girl and her "kidnapper." In many ways this is a movie children would identify with and enjoy, but it's not simplistic kiddie fare. Neither is Bouanich a traditional child starlet like Shirley Temple, whose talent had a limited range, or like Dakota Fanning (Man On Fire, I Am Sam), whose acting skills are so potent it's a little unnerving. She's just a kid being a kid, but with an intuitive understanding of the heart and soul of this kid she's pretending to be.